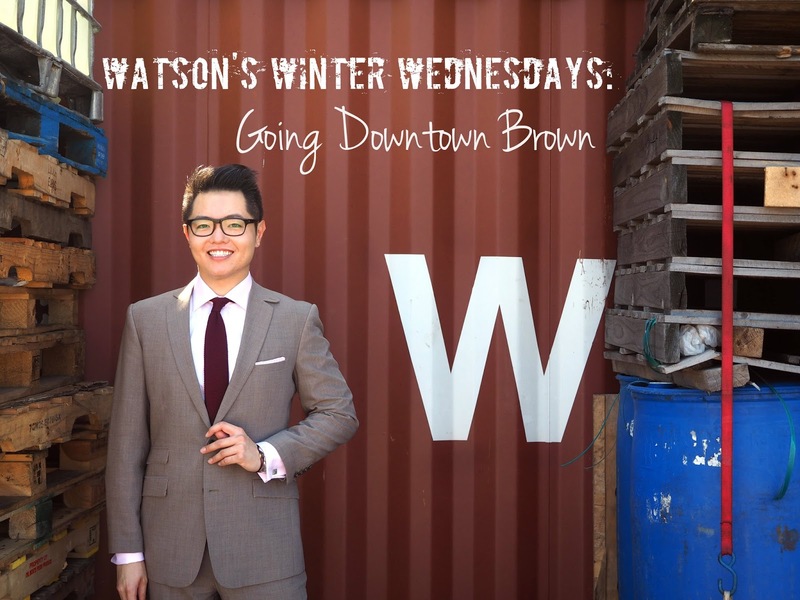 This is the second installment of Watson's Winter Wednesday (if you missed the first, check it out here), where he shows us how a gentlemen can rock the brown suit and scarf without looking like a hobo. For more stylish outfits, take a look at his Instagram feed (@cnostaw) and remember to check this blog next Wednesday for his third installment. PS. 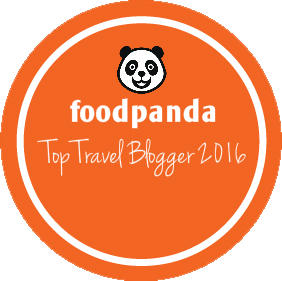 Don't forget to like us on Facebook here to get more insider tips and deals - and go in the running to win a Dior travel pack! Brown suits usually invoke an image of retro fashion from the 70s and 80s, but that's also what triggered my sense of "Challenge ACCEPTED" when it came to picking out a new suit. It's definitely not a hue you see often these days, but with the right accessories and coordinating colors, I was pleasantly surprised by the compliments I received from friends and colleagues. Encouraging words such as "Oh, the brown actually DOESN'T make you look like a door-to-door salesman." With some experimental shirt and tie combos, I found that pink goes quite well with this particular shade of brown, along with a whimsical checkered pocket square. I can't tell you how happy I am that previously considered "controversial" colors like pink and purple are now socially acceptable in office wear. Finally, men now can find ways of complimenting our skin tones. I think I'm a winter. It's always been a bit tough for me to find a pair of glasses that complimented my rounder face. However, this pair from Stark Mikli featured super flexible joints that actually bend in all four directions, which makes them comfortable while staying in place. Functionality aside, the right spectacles can also frame a face and bring out features such as cheekbones and eyes. However, it's debatable if these benefits can overshadow people's judging glances of someone wearing lensless glasses. Tom Ford is one of those names that I always admire from afar. The price of luxury is something I can't fully embrace at my current salary. However, once that brand became the formal wear of choice for Agent 007, I couldn't help but step into the store once in a while, even if just to ogle and fantasize. You should have seen my face contort when I unwrapped this gorgeous scarf as a thank-you gift from my dear friend Eric Chang, co-founder of luxury furniture brand Hellman-Chang. The scarf itself is a godsend on those brisk days when the wind has a tendency to snake under your suit, as it blocks the cold air out and keeps the warmth in. As for these shoes, I wish I had more information about them. I was lucky enough to find them dramatically discounted at a Ferragamo sample sale, and they were a bit scuffed on the bottom having been worn during a fashion show. Lucky me, I have model sized feet. (Just blessed, I suppose.) I'm a big fan of the dramatic patterns in the leather, giving it the illusion of exotic skin textures, and I feel like the slim shape finishes the overall look quite well. Ah the man-bag. So much to make fun of but I stand firm on bringing one to the office, as it carries all my gadgets in one convenient package and protects them from the elements. And as always, I was drawn to this particular briefcase due to its interesting design and unusual shape. Lucky for me, this "Muse" style was on sale due to the YSL brand changing their corporate image and will be discontinuing the series. Cheaper AND guaranteed to be unique? Win-win. Look into dress shirts of colors other than just white and light blue. 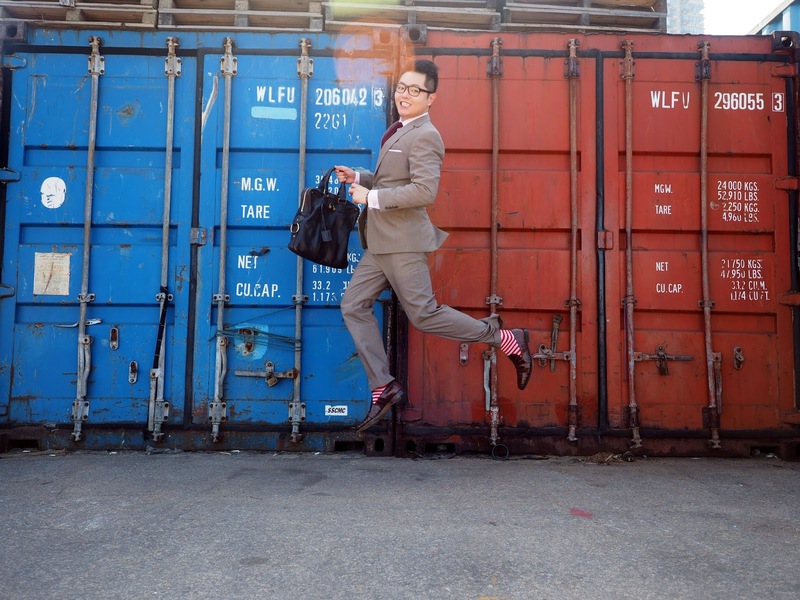 Pastels of pink, purple, even light green can add so much variety to your office wardrobe. Shine your shoes. Despite what Morgan Freeman says in The Shawshank Redemption, people DO look at a man's shoes. If you are looking into eyewear for purely aesthetic purposes, put in lenses with UV protection. Somewhat functional and pretty > just pretty.